Work wanted? It’s all a matter of perspective. There is a fair chance that work will finish in the next couple of days. Disappointing given I gave up a permanent stable job to go to a place where I was told there was guaranteed funding for at least the first 12 months by which time we would have built what we needed to build and be well and truly underway. Pre-Christmas our December pay was more than a week late but we all went to our week break believing that guarantees had been made for at least the January payroll. Sitting here now, that seems unlikely. The owners and shareholders of the business are from Singapore and I may well name them depending on how the next few days turn out. I could go into some of the reasons for the failure but let me just say that a few of us today were talking about presenting a person with a soap on a rope gift on the off chance that he ends up as a prisoner of Her Majesty. But there is still a fair bit of water to go under the bridge yet. And having written that I realise that is is a metaphor in poor taste as fellow countrymen continue to suffer in the floods in Queensland. That puts things into proper context for me and I realise I don’t really have too much to complain about. And consider the tale of young Jordan Rice who when in the arms of a rescuer told that rescuer to take his younger brother first. He and his mother were then swept to their deaths. 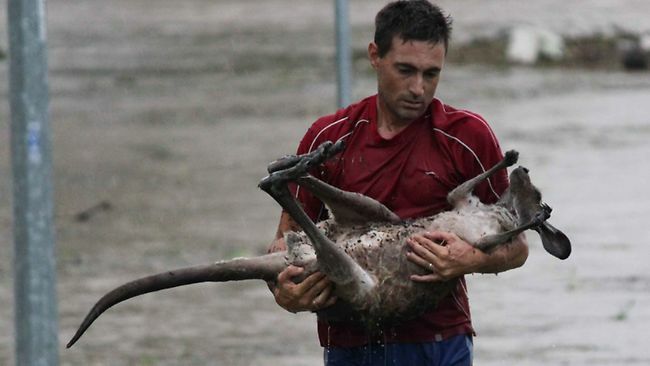 Then there was the courage shown by Ray Cole, the roo man, who waded into the floods to save a young joey that was struggling to stay afloat. And then there were these blokes who waded into the waters to save a horse. So do I really have anything to worry about. The answer of course is an emphatic no!